Konami continue to build up to the big first PES 2016 announcement. As we reported earlier, the first bit of info, and hopefully screens and videos, for Pro Evolution Soccer 2016 will be released in June, 2015. Konami now further fueled the hype with a series of tweets that went largely unnoticed, since being written in reply. The big Pro Evolution Soccer 2016 reveal is set to happen in June. 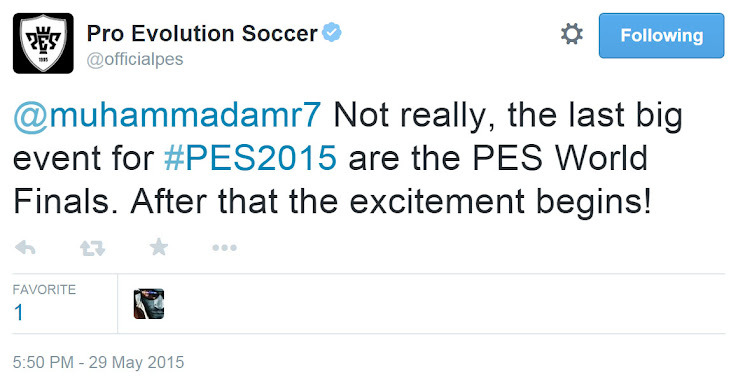 Asked when people would learn more about the upcoming PES 2016 game, the official Pro Evolution Soccer twitter channel replied "All I can say is wait for our first announcement. It will blow you away!". Unwilling to give more details of the PES 2016 reveal away at this time, Konami stated that people would "have to wait just a little bit longer", before closing in on the date of the announcement by confirming the PES World Finals as the "last big event for PES 2015". Taking place in Berlin around the time of the Champions League final on June 6, the PES World Finals will determine the PES 2015 World Champion. Konami already confirmed its presence at E3, which takes place later in June, between the 16th and 18th, and it now appears more than likely that the PES 2015 reveal will take place in Los Angeles. Following EA Sports announcement about the inclusion of women's national teams in FIFA 16, we can't wait to hear what Konami has to show for PES 2016. In the meantime, check out the first details regarding PES 2016 licenses as well as news about Brazilian and English commentary.